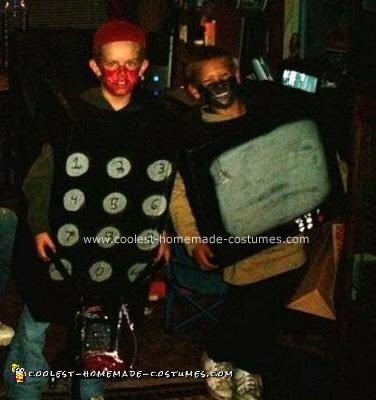 These Homemade TV and Remote Halloween Costumes were made completely from things we had at home. Our boys wanted to do a costume that went together, and would get a lot of laughs. What they came up with was a TV and remote control. We just used some boxes we had (make sure they are as close to the body size for easy movement), drew on the patterns, and painted them with black and silver paint. We cut out the holes for the head, legs, and arms. We painted their faces with face paint. They wore black sweat suits for warmth under the boxes. These costumes work great for two people going to a party together or individually they are still contest worthy. They are fun and easy to make. The best part was the total cost was zero. If you do not have the stuff at home total price to buy supplies would be about $10 for everything. Happy Halloween!